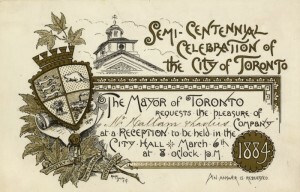 Invitation to Toronto’s semi-centennial in 1884. Toronto Reference Library, Baldwin Room, “1884. Reception. VS”. Today marks 180 years since the former Town of York was incorporated as the City of Toronto. It was given a new name, distinguished from New York and a dozen or so other places in the province. The city’s earliest neighbourhoods were the five wards named for the patron saints of the British Isles: St. George, St. Andrew, St. Patrick, and St. David, and for St. Lawrence, a patron saint of Canada. Subway stations and public spaces remind us of these past neighbourhoods, building layer upon layer of commemoration. Toronto recently celebrated its 175th anniversary as a city in 2009 with gatherings, parades, and a video designed to inspire pride in the city. Five years later, public events geared towards celebrating the establishment of the City of Toronto are calling upon us to gather where others stood before us. With a civic election looming in the fall, the media is again providing the advice that “[r]emembering the past is a useful step toward moving forward together.” But what pasts are being remembered? I am a closeted patriot: I find points of pride in my identities and their symbols, but I also believe there is value in understanding these symbols from a critical perspective. As we often must be reminded, commemoration tells us as much about our present as it does about our past. When I consider acts of commemoration, I often wonder if the reason we wrap ourselves up in them like a security blanket is not because we see the past through a present lens, but because commemorations are about shared history and the stories that we tell about ourselves. David Lowenthal suggests that “in celebrating symbols of their histories, societies in fact worship themselves.” When discussing commemoration, personal pronouns are used: My heritage, our past. Memory — not history — is the guiding force behind acts of commemoration. So, on Toronto’s 180th birthday, I want to ask: What symbols of Toronto’s past are we celebrating? How does Toronto’s collective memory impact its present? Looking back eight decades to the centennial program of 1934, we see that Toronto highlighted its present and looked forward by envisioning itself as a city with growing diversity. For example, a pamphlet of the day referred to Toronto as “a melting pot,” a label the city no doubt would eschew today, so as to distinguish itself from the United States. Interestingly, the programmes did not give a particularly high amount of attention to the Torys and Rebels that established this city and built upon it in its early years, but instead celebrated its civic and federal institutions. The city held events to commemorate the centennial. The CNE Coliseum (now Ricoh Coliseum) hosted an impressive thanksgiving program attended by the Governor General. It featured a choir of 2,500 singers, as well as a service given by a Jewish rabbi, ministers of the Anglican, Presbyterian, and United Churches. Curiously, Roman Catholic representation in this service was absent, noted the Toronto Star. The March 6th, 1934 edition of the Star mentions the birth of a “Centennial Baby.” A girl born in the city’s Parkdale neighbourhood to a Macedonian father and a Bulgaria mother became the first child born as Toronto entered its second century as a city.. “Don’t you hope she lives to be as old as the city is to-day, and has a happy prosperous life?,” the article asked. The Star’s pages from 1984 (Toronto’s sesquicentennial) and 2009 (the 175th anniversary) emphasize a multicultural city and project hope for Toronto’s future through observances of its past. Some of Toronto’s anniversaries have occurred during economic downturns, which affected the style of commemoration. Not all citizens in 1934 were in favour of spending taxpayers’ dollars on the civic centennial celebrations, which took place during the depression and an election year. The 175th anniversary in 2009 also unfolded during a period of economic uncertainty, so it was respectably modest in its nature. In fact, although Toronto’s past anniversaries have had a celebratory tone,they have not been boastful spectacles.This trend might be explained by the city’s infamous civic thrift. For instance, in 1934, many city councillors opposed the distribution of a centennial pamphlet entitled “From Wigwam to Skyscraper” — not on the grounds of its content, but because an astounding five thousand copies were planned — and this was seen as grandiose. 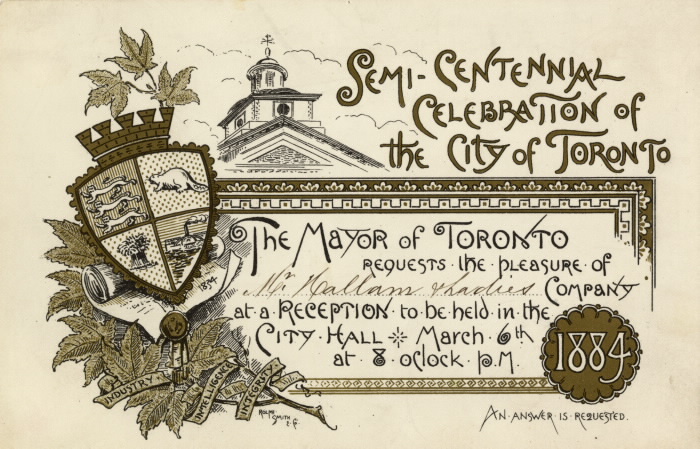 The pamphlet is one of the few centennial documents in which reference is made to the era before Toronto was incorporated. While we spend an awful amount of time considering how we commemorate, less attention is paid to when we commemorate. Why is it that an arbitrary moment in time — be it a year or an exact date — is often chosen to become the touchstone for a larger change? As a result, the preceding days, weeks, months, and even years are lost to the moment. However important that moment might be, it is a fixed point in time that has been created by its future. A recent Toronto example: the very act of commemorating the bicentennial of the Battle of York placed a level of importance on the battle and the War of 1812. Many critics have argued that such emphasis lacked consideration of wider historical contexts. When we commemorate an anniversary of the City of Toronto, we collectively emphasize the importance of the established city and, perhaps unintentionally, ignore the time that passed before. Similarly, the 1967 centennial celebrations and 2017 sesquicentennial celebrations of Canadian confederation have and will continue to engrain in the collective mind the importance of the confederation of the Canadian nation-state. Commemoration may shed light on pieces of the past for consumption by the general public, but we should not be surprised when these events neglect prior pasts or when continued emphasis is placed on the importance of the nation-state. Celebrations and commemorations of civic identity are more often than not caught up in how we see ourselves and what we want to become, rather than a reflection of the ways in which we have progressed and in which we have failed. Within this process, historians have a duty to provide useful context and analysis that inform our collective historical observances. Excellent article, Kaitlin! Very well put and a good reminder on City of Toronto Day.